The idea of mashing up my passions for both Gypsy Jazz and illustration could have been obvious but only popup in my mind a couple of weeks ago. It didn’t take me long to let myself inspired by Mr Django Reinhardt for a sketch I started last Sunday. 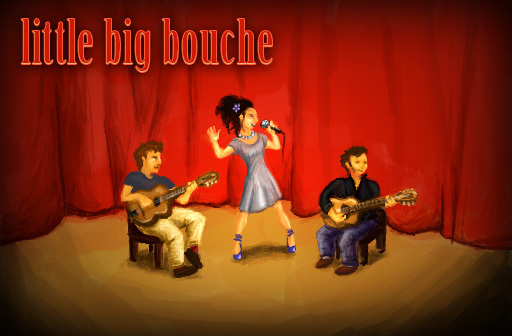 Here is an illustration done for the release of Little Big Bouche‘s first demo, the French Gypsy jazz trio I have been playing with for a few months now. As the artwork shows above, Aurore does the vocals, Yann is the guitar soloist and I do the comping. We play in the Django Reinhardt style, but, thanks to Aurore, we have vocals for both lyrics and improvisation on top.